If your property is water damaged due to flooding or broken pipes, we can extract water and then dry and dehumidify effected areas so that your walls, furniture, carpets, and ceilings can be restored as quickly as possible. 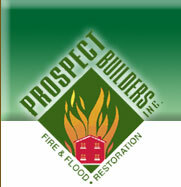 By acting quickly in an emergency, Prospect Builders can save you thousands of dollars by mitigating water damage so that you don't have to replace your carpets and furniture. No matter the size of the damage situation, our skilled team gets the job done. For tips about what steps you can take when your property is water damaged, click here. Our well-trained team has the equipment, the proven expertise and the know-how to dry your home as quickly as possible before the onset of damaging mold and mildew.